Your ophthalmologist Inge Groth-Fromm, MD completed her residency at the prestigious University Hospital Dusseldorf. After her own private ophthalmology practice in Hannover, she has been the head of the ophthalmologists Kurfürstendamm 54 as the managing owner and the head physician since the mid 90s. Her commitment is to continually improving the practice, leading to patients being treated better. She does laser surgery herself and gives helpful advice in natural health and nutritional medicine. Your ophthalmologist Rinata Sigal, MD received her medical diploma from Norbert Anders, MD, professor of ophthalmology at the Charité. After working at the eye clinic Bellevue in Kiel and at the eye clinic in Neukölln with Prof. Duy-Thoai Pham, MD, she worked with the expert team of ophthalmologists Kurfürstendamm 54 since 2009. She is specialized in eyelid surgery and carries out laser treatments. 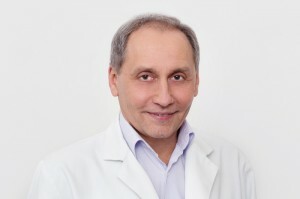 Your ophthalmologist Sergij Tkachov, MD studied in Kiev, St. Petersburg and Moscow and is a specialist in ophthalmology since 1983. Until 2000, he worked as a senior consultant at the University Hospital in Dnepropetrowsk (Ukraine). His practice was followed by activities at eye clinics in Halle, Neubrandenburg, Potsdam and Oldenburg, ultimately as a practicing ophthalmologist in Genthin. Since 2009, he has been part of the team of ophthalmologists Kurfürstendamm 54. After many years of experience, he has become an expert in eye laser surgery.